Facial Essences: What Are Face Essences and How To Use Them? — Beauty and Etc. Facial Essences are known to be a major skincare step within Korean skincare. Essences are known to be light weight, but are filled with antioxidants and also provide additional hydration within your skincare routine. They are also known to be a great base for serums. I particularly like that they help fight anti-aging by targeting fine lines and dull skin textures. My skincare routine is heavily revolved around anti-aging and this is what made adding a facial essence so intriguing to me. How I use a Facial Essence. I begin by making sure my face is freshly washed with soap and water or after using micellar water. I then use a toner. I use various toners that either can be sprayed directly onto my face or applied with a cotton round. Next, I apply my essence. Application: I use an essence after my toner but before my serum in my skincare routine. It’s used in both my morning and evening skincare routine. One thing you may notice with an essence is how they are applied. Unlike a toner, an essence is pressed into the skin and then massaged in. Applying an essence with a cotton ball would not be beneficial in my opinion, as it would soak up too much product. The texture of an essence can be anywhere from a very light watery texture to a texture that’s a bit heavier - almost like a serum. Most of the essences that I have used are water based. Packaging for essences are either made with a spout, spray nozzle or a pump. Do you need to use a Facial essence? Do I need a facial essence? You may ask yourself, Do I need to use a facial essence? I asked my self this question numerous time prior to my first purchase of a an essence. The answer is NO, you don’t need an essence. But I truly believe it’s something that is benefiting my skin. As long as there’s a benefit, I’ll continue to try out different essences and formulas. Which is essence is right for you? Not sure which essence is right for you? There’s so many sites and guides that make recommendations of essences that are dependent on your skin type (dry, normal, combo). I can’t recommend or say one type or brand is better than an other. Picking out an essence is very much dependent on what you’re looking to achieve. I have combination skin (normal to oily). I prefer a an essence with a heavier constiency during the winter months and would rather use one with a very watery texture during the summer months. Also the other products that I’m using in my skincare routine heavily influences which essence that I may use for that routine. Common INGREDIENTS in essences- Reading labels. As we know, reading labels and understanding them are very important with skincare. The first couple of ingredients listed below are known to be some of the most popular and active in many of the essences that I’ve tried. I try my best to stay away from silicones in my skin care products. I understand how they help to prolong makeup and is often used in items such as primers. But I don’t think they’re necessary in my skincare. I checked into the essences in my collection and was able to identify a few different types of essences. Water based- One of the most common ingredients in essences. These essence are watery as water is the first ingredient. These types of essences easily soak into the skin. Snail Mucin- there’s been some controversy in the way the mucin is extracted and expected results. Some claims say that snail mucin may help to lighten acne marks and prevention of future break outs. But I solely use snail mucin for hydration purposes. The texture is extremely thick and can be a little uncomfortable to use the first couple of times. Saccharomyces Ferment Filtrate-almost-water-like stuff that you get by fermenting and filtering yeast. Known to be rich in essential minerals, amino acids, beta-glucan and vitamins. The texture is thicker than water, but not as thick as snail mucin. my Current 3 essences i’m using and why? After trying out different types of essences, I now know that I prefer a tackier consistency, at least during the colder and drier temperatures. I use an essence in the morning and the night. They can range in price from as little as $20 and as high as $200. Personally, I could never see myself paying in the upwards amount for a water based product. Price: $49 for 5 oz. Ingredients: Water, Vitis Vinifera (Grape) Fruit Water*, Citrus Aurantium Amara (Bitter Orange) Flower Water*, Glycerin*, Methylpropanediol, Glycolic Acid, Sodium Hydroxide, Vitis Vinifera (Grape) Juice*, Caprylyl Glycol, Citric Acid*, Arginine, Sodium Benzoate, Paeonia Lactiflora Root Extract*, Phenylpropanol, Potassium Sorbate, Sodium Phytate*, Linalool, Limonene. Review: This was the first essence that I ever purchased. It’s a glycolic toner that is aimed to help with exfoliation, moisturize and provide radiance. This toner is very much water based. After applying it my face doesn’t feel super hydrated. I also don’t feel that it provides a noticeable glow or radiance after using it. Based on these reasons I will not repurchase it, but I’ll finish it. I purchased a travel size/ deluxe size of this essence based on reviews. 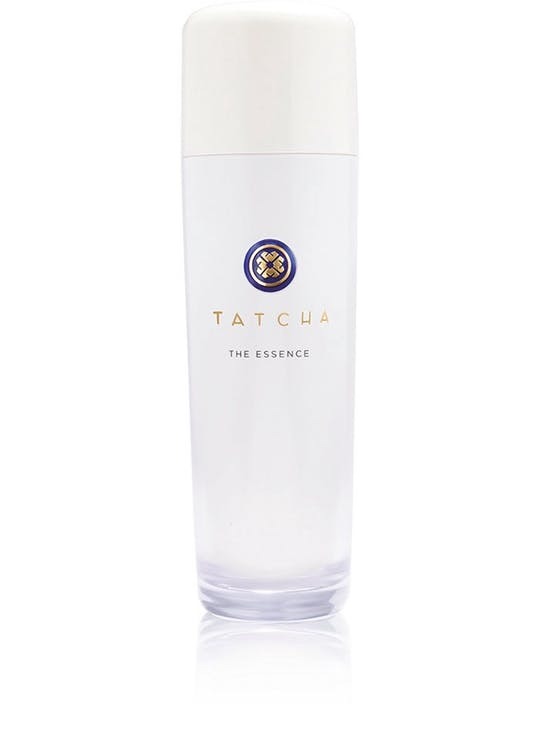 There hasn’t been a Tatcha product that I’ve tried that I didn’t like. I had a feeling I would really like this essence, but I could never bring myself to purchase the full size. I guess you can say I was setting myself up from the start. I really like this essence as it’s super hydrating and leaves my face soft. The consistency is a little thicker than the typical water essence. Water is listed as the 5th ingredient and the first ingredient in the essence is Saccharomyces/Camellia Sinensis Leaf/Cladosiphon Okamuranus/Rice Ferment Filtrate, which is a Green Tea, Rice,and Algae blend. The algae helps skin hydration, the rice provides protein and green tea is known to be anti-oxidant. Maybe on day I’ll take the plunge and purchase it. This essence is made with 96% of snail secretion. Snail secretion is made up of hyaluronic acid, glycoprotein, proteoglycans, antimicrobial and copper peptides. The Cosrx snail mucin essence is the most hydrating essence that I’ve used so far and the least expensive. The texture can be a bit slimly at first, but once you know how to work with it becomes easier. I apply 1-2 pumps to my hands, rub together and then I gently pat it into my face. When it finishes I fully intend on repurchasing it. Price: $10- i’ve checked over the ingredients and they’re not too bad. Also this toner is very inexpensive. I’m hoping to use this as replacement to the Caudalie essence. My goal is to finish the Caudalie essence by the summer to purchase and start using the Elf essence or the one below. Price: $42- I’ve actually tried this essence many years ago. At the time I had no knowledge of what an essence was or how it should be used. I do remember it being hydrating. I hoping to retest it again soon. Do you use an essence within your skin routine? If so, I would love to know which one. As you can see I enjoy trying out new products. If you’re interested in seeing my full Morning Routine, please let me know.